The integration of health and medical-related functions is progressing in KENTO with the relocation of the National Cerebral and Cardiovascular Center. 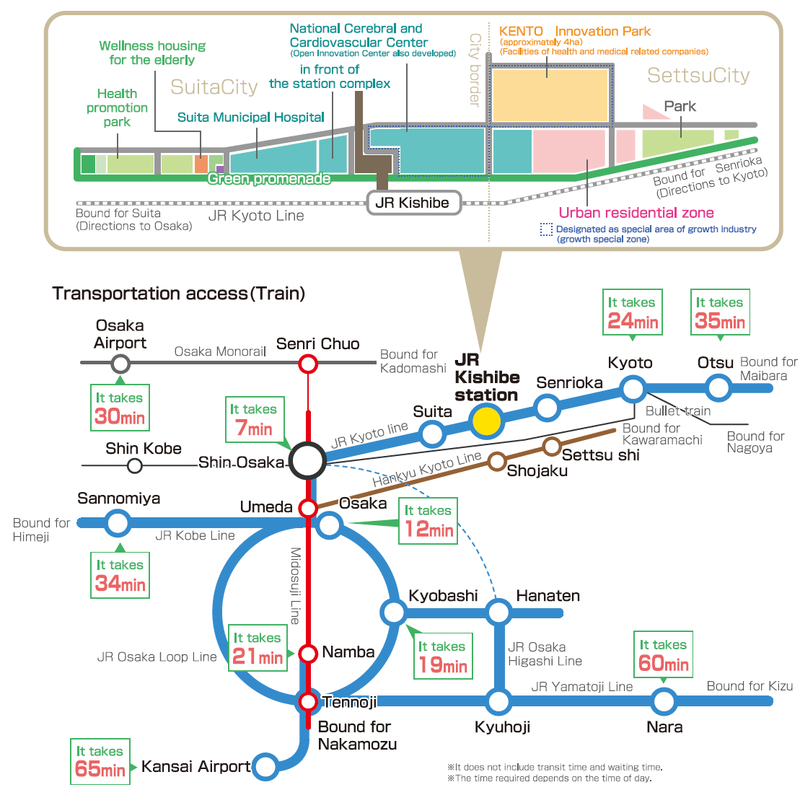 The area is in close proximity to Umeda and Shin-Osaka and is conveniently located in terms of public transportation, and is expected to develop into a new research development base in the health and medical fields. On December 22, 2017, the country’s consent was obtained for the basic plan established in Osaka Prefecture, Suita and Settsu based on the Regional Future Investment Promotion Act. The Regional Future Investment Promotion Act provides assistance measures that meet the needs of businesses, such as capital investment to business operators that drive the regional economy (*) according to the “basic plan” established by Osaka Prefecture and municipalities and agreed upon by the country. Today, we notify you that the basic plan established by Osaka Prefecture, Suita and Settsu based on this same Act obtained the country’s consent on December 22, 2017. In order to receive the support based on this Act, there is a need to submit the “approval application of the regional economy driving business plan based on laws related to the foundation strengthening of the growth and development of the region based on the promotion of regional economy driving businesses” to the Governor of Osaka Prefecture and obtain his approval. Taking advantage of the high potential in the field of life sciences in the relevant region where the Northern Osaka Health and Biomedical Innovation Town (“KENTO”) is located extending across the cities of Suita and Settsu to promote the further integration of health care-related companies. 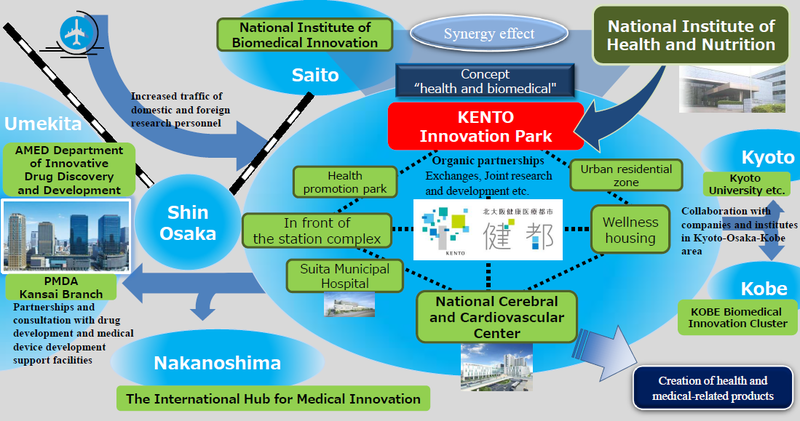 With the region selected as the site for the National Cerebral and Cardiovascular Center, KENTO supports the collaboration of industry, academia and government and by developing a medical cluster based on “health and medical” concepts, we aim to create a high economic ripple effect on the area. Regional economic driving businesses refer to businesses that drive regional economic activities by using the region’s characteristic (integration of industry, tourism resources, local products, technologies, human resources, information and other characteristics seen from a natural, economic and social perspective) to create high value-added, expand regional trade, increase orders and produce economic effects equivalent to business operators of other regions. When satisfying the conditions of “3. Matters related to business content required as a regional economic driving business” in the basic plan, there is a need to submit the “approval application of the regional economy driving business plan based on laws related to the foundation strengthening of the growth and development of the region based on the promotion of regional economy driving businesses” to the Governor of Osaka Prefecture and obtain his approval. March 2016: As part of the basic transfer policy for government agencies, Osaka Prefecture and the Ministry of Health, Labor and Welfare and other relevant agencies coordinated to discuss the relocation details and local preparations required for the relocation processes ahead of the complete relocation of the National Institute of Health and Nutrition to Osaka, and it was determined that the relocation would commence until March 2017. With the relocation to KENTO, we expect the creation of innovations due to partnerships with health-related companies based in Osaka Prefecture and the extension of healthy life expectancies of local residents with cooperation from municipalities.